The field devices T-ID, T-XROAD and T-EXSPEED belong to KRIA's T line, dedicated to vehicle traffic monitoring. They are all integrated onto an internet-based distributed platform converging all data from the field towards the Event Server Central Unit that manages and redistributes the information to the fixed and mobile client stations by networking. T-XROAD is an evolution of T-ID and is the most innovative digital system for red light violation detection and car plate identification, it doesn’t require any field sensor and is approved by the Ministry of Transport in Italy in compliance with art 146 paragraphs 146 and in Austria. Typical applications at crossroads and at railway intersections. T-EXSPEED v.2.0, can simultaneously detect multiple vehicles in transit on up to 3 parallel lanes, certified by the Italian Minister of Transports and by METAS (Swiss National Metrology Institute). 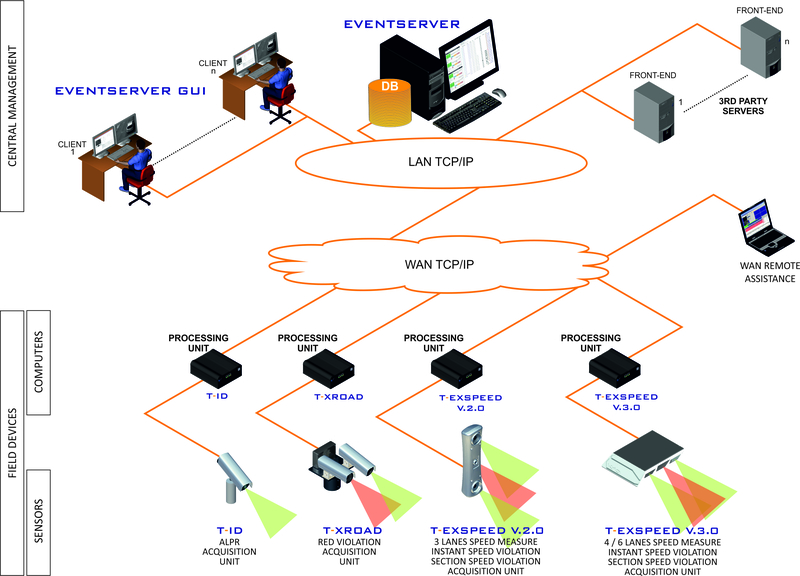 T-EXSPEED v.3.0, the latest and most advanced stage of traffic monitoring technology, monitors up to 6 lanes. T-EXSPEEDs detect vehicles simultaneously even in double directions, measure all their speeds with 99% accuracy. They recognize red light violations at intersections, reading every vehicle’s license plates and dangerous goods placards. Event server is a central flexible unit evolving continuously and grants the safe management of the data received from the field devices, the remote control of the data and the interfacing of the System with third parties.